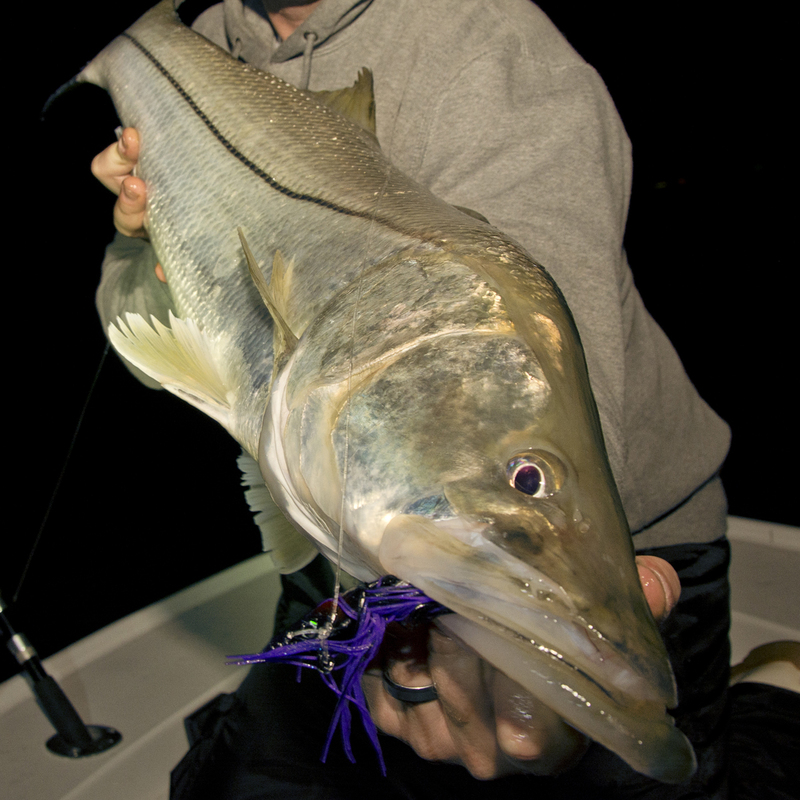 It’s not hard to get into a winter rut when the cold Northeast winds cut the air and throw a good chop on the water. 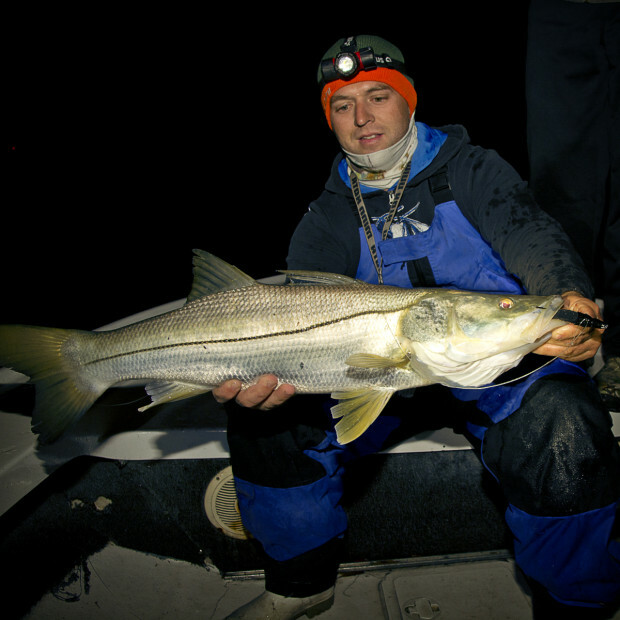 Florida anglers, could generally be called “fair weather” anglers. When your normal fishing attire is flip flops, sunglasses and a pair of board shorts, it can be hard to get motivated when air temps begin dipping in the upper 40’s. 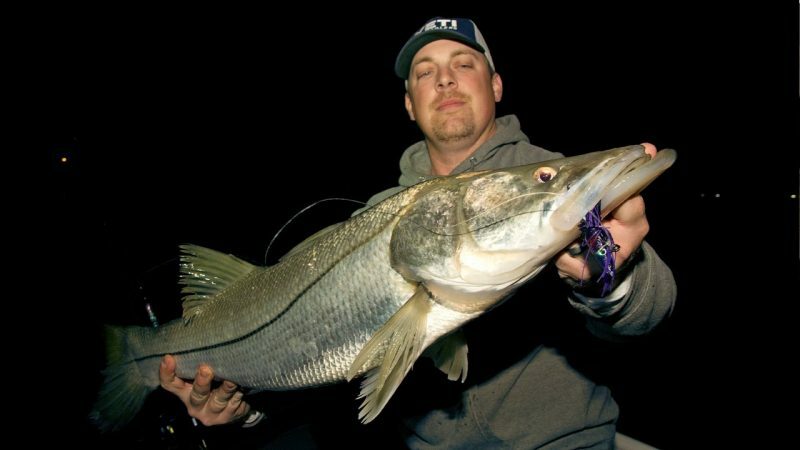 Fortunately, for those anglers who’ve got the desire and drive, great fishing opportunities exist around Southeast Florida’s inlets and coastal bridges. I recently joined Captain Chris Britton of Grey Ghost Charters fishing his home waters of Ft. Pierce in hopes of targeting over-sized snook that take winter residence along the Intercostal Bridges. I arrived to the boat ramp, as the sun was getting ready to set behind us. The air temps were already in the mid 50’s with rapid drop expected as the cold North wind blew in at 15 knots. While some of our Northern visitors may be comfortable wearing shorts and a long sleeve in these temps, each of us donned several thermal layers and foul weather gear on top of that. There’s nothing worse than being cold while waiting for a bite to get hot. Our travel time was short, running a few hundred yards on idle, we dropped in the Minn Kota iPilot trolling motor and used it’s GPS guided anchor feature to hold our position down current of the wooden fender system that borders the navigable channel. We were about 90 minutes from low slack tide and the outgoing current was still moving along nicely. 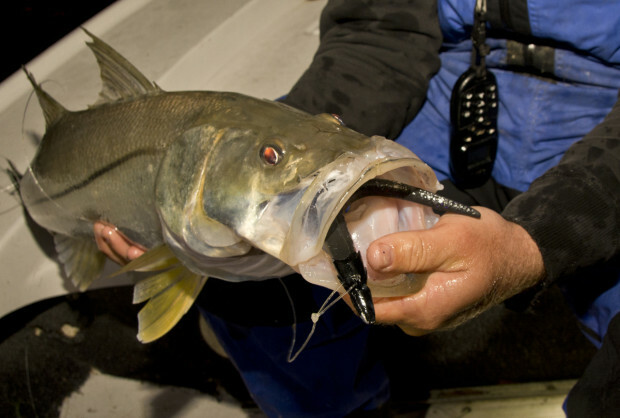 There are few fishing techniques as effective as “swinging” jigs and plugs when fishing moving water. 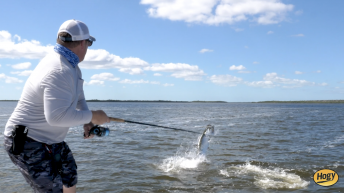 This technique allows an angler to naturally present a lure by swimming it across the current, allowing it to sweep along with the tide, exactly like the natural forage. 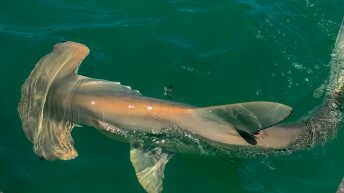 The most challenging aspect of this technique is learning how to gauge where to cast the lure up current and how heavy the lure should be in relation to the current velocity. 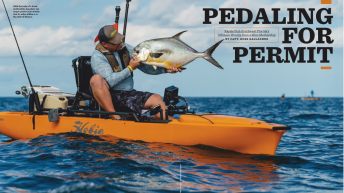 Over the course of a tide, these variables will change dramatically, requiring constant tweaks and adjustments to maintain an effective presentation and hook more fish. Here is my thought process while developing the perfect “swing”. I’ll first reference my Raymarine Depth Finder to determine the target depth around the structure. I’ll then take a mental assessment of how fast the tide is flowing. You may find the need to make a practice cast or two while getting a good read on the velocity on the bottom, as it can be slower or faster than the surface current speed. Generally, in depths six to ten feet deep, 1oz – 1.5oz is perfect. Once I get over twelve foot depths, I’ll stick to 2oz heads. Your next step to begin reading the current speed and determine how far up-current you’ll need to cast ahead of your target structure. The goal is the have the jig reach bottom and begin sweeping three to four feet ahead of the target structure. Key structures that will hold snook are concrete pilings, wooden fender embankments and light lines illuminated from above. You will find times that your up-current cast may be fifteen to thirty feed ahead of the target. Once you’ve hit bottom with your jig, retrieve the slack to keep up with the jig as it comes towards you. Use short pops of the rod tip to bounce the jig four to six inches off the bottom. Most strikes will occur just after the pop, while the jig is sinking. Quickly pickup your line slack and set the hook. When fishing near heavy cover, quickly gaining any extra line dramatically increases the odds of pulling the fish away from structure. 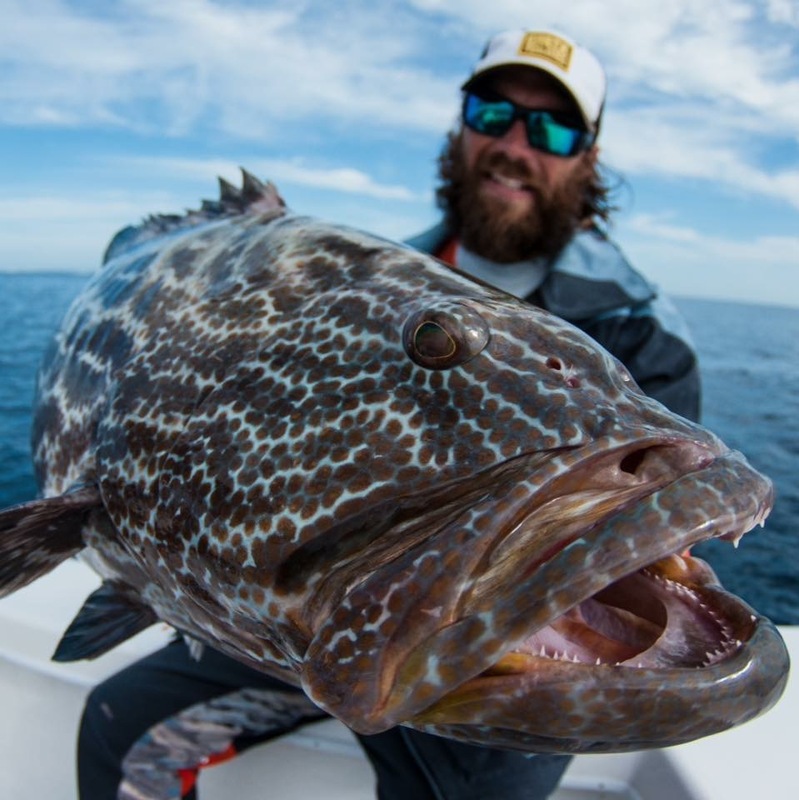 One great way to put extra muscle against the fish is to carefully walk backwards on the boat deck, while keeping the rod tip just above the surface. This allows you to quickly pick up five to eight feet of line while controlling the fish and preventing them from breaking you off in structure. I’ve had the best luck using jigging soft baits from Hogy Lure Company. 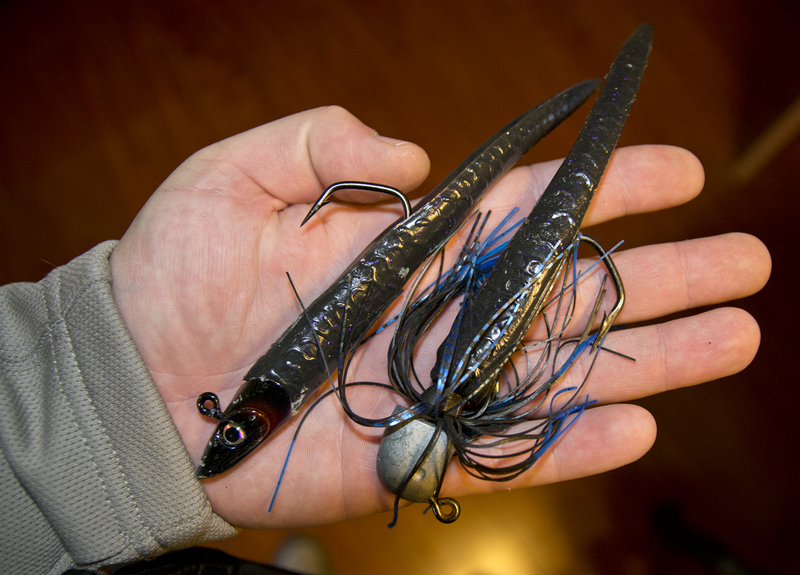 My favorites are the 1oz – 2oz Skirted Barbarian Jigs and the newly released SE Barbarian Jigs. Both offer excellent strength and performance based on the VMC Barbarian Jig Head platform, along with the long, seven to nine inch dancing soft bait trailer behind them. My favorite night time color is the black/purple or Blurple pattern. During the day, it’s often a toss up between using silver and bone white patterns.